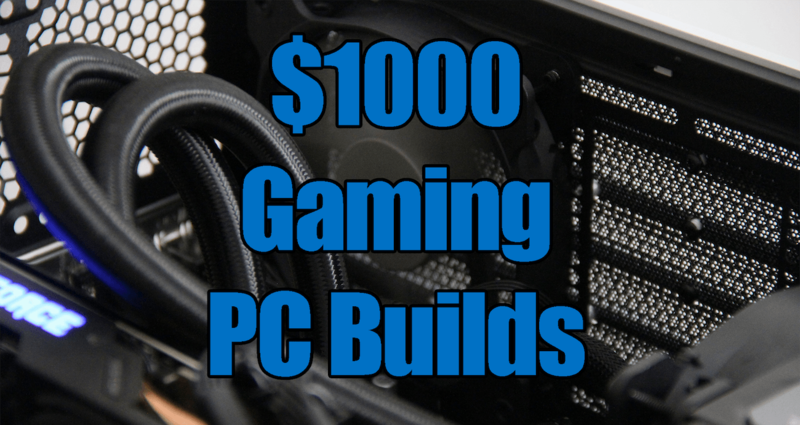 Get revving with the best possible $1000 gaming pc build, updated monthly. This gaming pc build is a really good build for those who want to max out pc games at 1080p and 1440p resolutions — this pc build is just enough for the savvy pc gamer who doesn’t want to worry about scaling back on pc game settings. The hardware below for the $1000 gaming pc build is chosen based on two main things, performance and quality for the best possible price. All of the hardware is conveniently linked to Amazon. April 2019 Update: The $1000 pc build is a very powerful mid-range pc build worthy of gaming at resolutions anywhere from 1080p to 2K with maxed out settings. Included is an RTX 2060 graphics card and this is paired with an Intel Core i5-8400. The included gaming CPU this March is the Intel i5 8400. This gaming CPU is a great choice and purchase for the cost. If you have a little more to spend on the CPU, check the alternatives tables below where we include the Intel i5 8600K, which will give you more performance should you think you need it. The RTX 2060 graphics card is very capable of maxing games out at 1080- and into 2K resolutions without difficulty. The power supply unit (PSU) included is the EVGA Supernova 650 Pw 80+ Platinum PSU. This is enough juice to power this awesome pc build and is platinum rated PSU, making this one of the most power efficient PSU’s out there. For the pc case this April, included is the CORSAIR Carbide 275R. This is a very sleek, affordable gaming pc case that does it’s job — encapsulating your hardware while looking professional and sleek. If you want to upgrade to a better CPU, then the Intel i5 8600K is a great choice, however if you do decide to do this you will need to also switch up your motherboard to a Z370 compatible motherboard (to allow over clocking since the "K" in the 8600K signififes it is unlocked and easily overclockable). you will also need to add a cpu cooler as one is not included with the 8600K. If you are looking for the biggest bang for your buck performance upgrade, then upgrading to an RTX 2070 would be perfect. Think you need more memory in your build? Then upgrade to a 16GB kit of Corsair Vengeance. Looking for a little more oomph in your cooler? Then get a liquid cpu cooler such as the Corsair Hydro series H80i. Above are the suggested upgrade ideas for the best April 2019 $1000 gaming PC build, these are recommended if you have a larger budget or want some upgrade suggestions later on when you need an upgrade. Want more immediate gaming power — then the graphics card upgrade is definietly the first upgrade I would take. The upgraded card is the RTX 2070, so if you have the dollars to spend and want to upgrade this would be a great choice. Since the $1000 pc build above includes 8GB of RAM, you could bump this up further to 16GB with a kit of Corsair Vengeance LPX 16GB 3000MhZ RAM if you think you need it. Further, you could also plug in an additional 8GB kit, later on, to get 16GB if you find you need it. Not looking for the best $1000 gaming pc build?